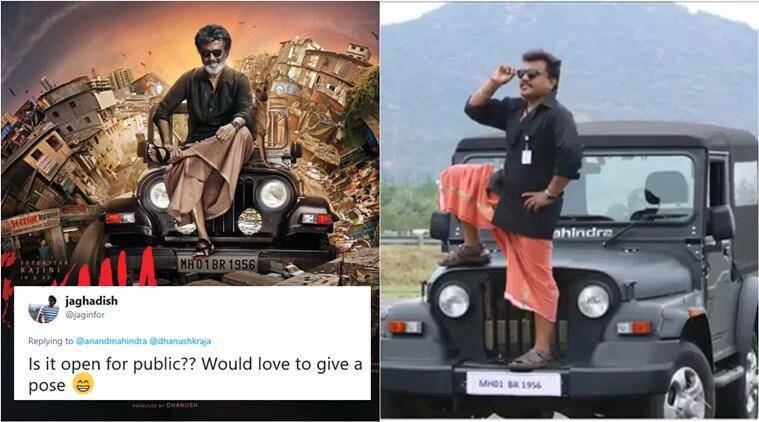 'Kaala' craze: Many employees struck Rajinikanth's pose on the same black vehicle used by the megastar. Quite unsurprisingly, Thalaivar fans now want it to be opened for the public too. Rajinikanth’s Kaala recently released worldwide and took Thalaivar fans by frenzy, and it seems people at Mahindra can’t get enough of the latest film too. After Anand Mahindra saw the iconic actor posing atop a bonnet of his company’s vehicle in the poster, he couldn’t help but go all out in a quest to acquire it for their museum. But, that’s not all. No sooner did people at his company get hold of the Thar aka Rajinikath’s ‘car throne’, they were set to recreate the superstar’s signature pose from the film. Sharing a cool clip of employees striking the same pose on the black vehicle used by Rajinikanth in Kaala, the team at Mahindra Research Valley in Chennai couldn’t keep calm. And unsurprisingly, one of the Thalaivar fans went a little further by impersonating his pose in a similar black shirt, a pair of aviator glasses and a lungi! Sharing details about this fan, Mahindra wrote, “Bala, the guy in the lungi is now known as ‘KaalaBala’”. O wowww…#Kaala Rajnikanth Style …. Will you be launching a limited edition #KaalaThar? Is it open to public? Would definitely love to visit. Would love to see you posing with ‘The Kaala Thar’ sir. Thats why workplace at #Mahindra is Fun. Jealous on You. !!! Yeah, sure. Anything Thalaivar has touched is gold for us. Here’s also a chance to win some free tickets. Get your very own Superstar selfie at the unveiling of #THAR from the movie #Kaala at Sathyam Cinema, Royapettah, Chennai. Rajinikanth fans, are you excited? 2 Shah Rukh Khan's SASSY REPLY to a troll for staying mum on social issues gets a big THUMBS UP!